Professional runners often talk about the little extras: it’s not just the miles and workouts that make the difference on race day; it’s all the other little things done throughout the day that keep them healthy and able to run those miles and nail those workouts. The problem, of course, is that we’re freaking busy. We’re not pros, so we don’t have time to sit in NormaTec boots, take afternoon naps, or spend hours lifting. It takes enough time just to get the running done and so the little things often get skipped. 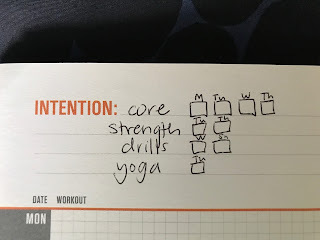 On Sunday nights, I look at my training plan for the week and figure out what days make sense (workout-wise/time-wise/Baby-wise) for strength, core work, and drills. (Each week, I aim for two strength sessions and four core sessions, although some of those core days are just a quick plank series. I do drills before harder or longer workouts, which is usually about twice a week.) 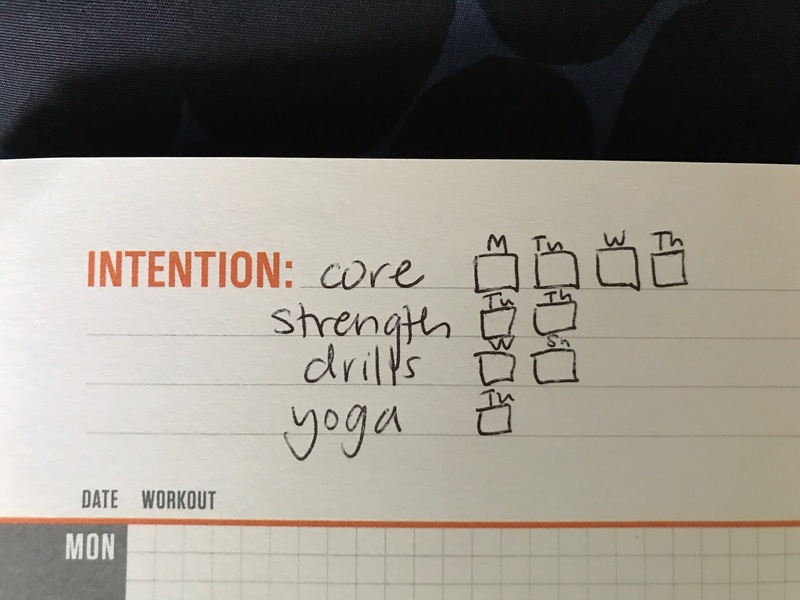 In my log I write down which days I’ll do them and make little check boxes for each session. It seems trivial, but it works for me to (a) have a plan and (b) write it down. If I haven’t planned it, I won’t make the time for it (which usually just means getting up earlier) and if I don’t write it down, I’ll just keep putting it off until all I’m left with are days when I really can’t squeeze it in. Plus, checking it off at the end of each day feels good: at least one thing got accomplished. An example of my log with my intention for the week. Back in 2014, I gave up TV as a New Year’s resolution, in part because I wanted more time to take care of these things. (That same year I qualified for the 2016 Trials, which I don’t think was a coincidence. I wrote about it for The Washington Post and also achieved a life goal I didn’t know I had: making it on FloTrack.) We as a society spend a ridiculous amount of time watching TV, even though we also claim to be crazy busy. 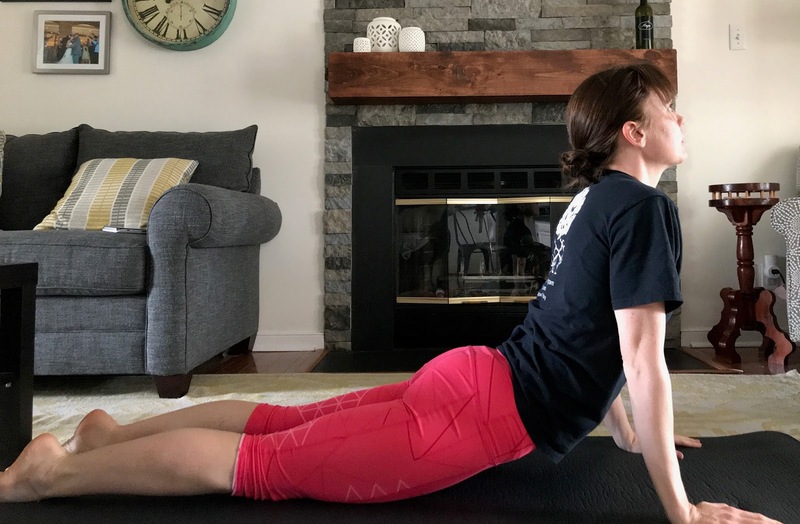 If it helps you unwind and relax (which is important for running well!) then go for it. But what I realized over the year was that doing other relaxing things (like reading or going to bed earlier) helped me more; an hour spent reading felt longer and more refreshing than an hour spent watching TV. Although I do watch TV now, I watch significantly less, which means I have more time in the evenings for yoga/strength work/relaxing/just going to bed. A much simpler trick than banning TV is to set an alarm on your phone telling you to go to bed. I usually set mine for about thirty minutes before I want to be lights out, so I have enough time to stop whatever I’m doing, get ready, and have some devotional time. Admittedly, sometimes I snooze this alarm just like I would a morning one, but I do think it helps keep me accountable for what I promised myself. Apparently, even in my thirties, I still need someone telling me to go the fudge to sleep. I foam roll after nearly every run and (on days I’m really on top of it) before some runs. Doing it at the same time every day makes it a simple habit; like brushing your teeth before bed, it becomes routine and just takes a few minutes. You could put the roller where your store your running shoes as a reminder to do it when you come back from your run or beside your bed as a reminder to do it before bed. Alternatively it’s also easy to roll while watching TV or, if Baby lets you, while playing on the floor. Baby "helping" me foam roll. Meal prep is everywhere these days and while I don’t quite go to the extent of others, at the beginning of the week I plan out each night’s dinner and do all the shopping. It’s easier for me to take the time to make the decisions all at once and then the rest of the week I don’t have to think about what we’re going to eat or whether we have the right ingredients. If I don't make a plan and just scrounge something up, I don’t eat as well. This one actually does involve running, so I’m not sure if it counts as one of the “little extras” but I’m throwing it in here because it’s so important and is so often ignored: run your easy days EASY (so you can run your hard days hard). Compared to the others, this takes the least amount of extra time; it just means your runs will be a few extra minutes longer (and we’d all rather be running than lifting and foam rolling, right??). But too many people run moderately fast all the time, which means their bodies can’t recover properly. On my easy days, I wear a watch to make sure I’m going slowly enough, which for me is about two minutes slower than my marathon pace. 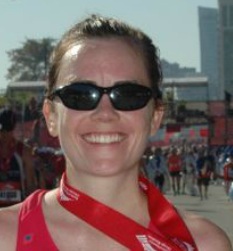 You should finish your easy runs feeling refreshed, not more tired than when you started. What are some of your tips and tricks for fitting it all in? Any other little extras you emphasize? I have a hard time fitting in strength work - I work full time and have two busy kids. I’ve found that on the days I want to work in strength I am more successful if I break it up - so a couple of days a week when I get home from running I’ll do some planks, at lunch in my office I do push-ups, and when I’m making dinner I do squats and lunges. I don’t know if it’s as effective as a single strength workout, but it works for me at this stage of my life and I tell myself it’s better than nothing! What are your drills? Is that like strides? I do not run competitively, and this post resonates as a time-tested approach to leading a healthy and vibrant life all around. Thank you.